Firing On All Cylinders: Bennett stands in an old culvert segment that lies on his Lazy W ranch. The Tarrant Regional Water District wants to lay a pipe on his property that is 3 feet wider and will require clear-cutting trees and building a road. How is Monty Bennett working to keep a pipeline off his land? With endangered animals, a cemetery, and a whole lot of money. Rambling over his land in a utility vehicle, Monty Bennett sounds like any East Texas rancher, talking about this grass versus that, about fences and which fruit trees produced this year. But Bennett happens to be a wealthy businessman who spends his workweeks in Dallas. The portrait of the typical rancher shifts a bit when he wonders aloud whether we might catch a glimpse of his kangaroos. Bennett keeps a low profile back in the city. He prefers one-on-one conversations to social events. Or maybe that’s because his 6,000-square-foot penthouse condo overlooking downtown Dallas isn’t where his heart is. It’s here on the ranch outside of Athens, Texas, an hour and a world away from Dallas. It’s 1,500 acres of rolling hills, pastures, trees, creeks, ponds, and wildlife—lots of wildlife. The Lazy W, parts of which have been in Bennett’s family for three generations, is home to a long roster of exotic and native animals. When he was growing up in Houston, Bennett and his brothers and grandfather would come up to the ranch for a few weeks each year and do guy stuff. They fished the ponds and chased armadillos. “I spent my youth getting lost in these woods and freaking out my parents,” he says. Now 51, he spends almost every weekend at the Lazy W. His wife, Marissa, and their two young boys spend even more time at the ranch. The couple got married here, and it’s where they want to be buried some day. They’re building a big house on the property, but for now home is an old farmhouse that, through the years, has been added onto and renovated. On the porch sits a flock of muddy boots turned upside down to dry. Bennett doesn’t think the pipeline will bring the promised benefit to people in Tarrant County, but it’s the line’s route, not its efficacy, that bothers him most. “It comes through the prettiest part of my ranch,” he says. Bennett is lanky and has salt-and-pepper hair. He is alternately laid-back and intense. Those who know him call him brilliant. He made his money as a hotelier, following in his father’s footsteps. He is CEO of the Ashford Group, a set of private and publicly traded companies that invest in, develop, and manage hotel properties. It’s one of the top 20 players in that industry in the country, with more than 130 properties around the world and $6 billion in assets. To the extent that he is known in Dallas outside the hotel industry, it’s probably from his involvement with conservative education-related causes and as a contributor to a long list of charities. In fact, Bennett may be better known in Fort Worth and Tarrant County than he is in the city where his companies are headquartered. Better known, more reviled, and more admired, all at once. During a Tarrant County political campaign last year, one mailer portrayed him as the “despicable puppet master” from Dallas who digs up graves and “wants to control our local water.” As ludicrous as those allegations might sound, the real issues at the center of that election were part of a very serious fight that could have ramifications for Dallas and its future water supply and, potentially, for the way governmental agencies across the state of Texas exercise eminent domain. It all started a few years back when the entity responsible for getting water to Fort Worth, the Tarrant Regional Water District, let it be known that it intended to take part of Bennett’s ranch and lay a pipe across it. The water district sued Bennett in an attempt to get the land. The case made its way to the Texas Supreme Court, where Bennett won on a procedural matter before being bounced back to a district court in Athens, where it now sits. In the meantime, his fight with the water district has grown from a pipeline right-of-way dispute into a battle over issues concerning accountability and openness in government. It involves several hundred thousand dollars, a sum Bennett has spent so far trying to change the elected leadership of the water district. But for Bennett, it all starts with the ranch. In the fall of 2010, Bennett found a notice posted on a gate at the Lazy W. It was from something he’d never heard of, the Tarrant Regional Water District. The agency was asking for permission to come on the land to conduct a survey for something called the Integrated Pipeline, or IPL. It many ways, it was a routine move for the water district, though one that some officials there must now surely regret. As North Texas’ population continues to grow, the agency has had to reach farther and farther to find and develop water sources. That means more pipelines running more miles under more vast stretches of Texas countryside and, sometimes, neighborhoods. The agency, with responsibilities for flood control and water development, provides water to about 2 million people in an 11-county swath of North Texas, through sales of raw water to cities and other wholesale customers that treat the water and sell it to their customers. The Tarrant Regional Water District’s roots go back 80 years. It is one of the largest suppliers of raw water in the state, with an annual budget of about $200 million overseen by five elected board members. Thanks to its friends in Congress and the Texas Legislature, it’s one of the most powerful, influential agencies of its kind. But that doesn’t mean that many people outside Tarrant County know what it is. Jim Oliver, longtime general manager of the water district, says what his agency does “isn’t real interesting” to most folks. “A lot of people still think we’re part of the city water department,” he says. But the public is starting to take interest. Until Bennett got that notice on his gate, the Integrated Pipeline wasn’t particularly controversial. The $2.3 billion project, a joint effort of Dallas Water Utilities and the Tarrant Regional Water District, will connect the two water supply systems for the first time. The 9-foot-diameter pipeline will run for 150 miles below ground, from Lake Palestine in East Texas, where Dallas has water rights, to TRWD’s Tarrant County lakes. According to TRWD’s long-range plan, the water demands of Dallas Water Utilities customers will exceed supply in about 20 years. By then, however, the Integrated Pipeline should be finished, adding the resources of Lake Palestine to the system. Those are among the last pieces of the shared line scheduled to be built—which is good considering that if things go as they have lately, the TRWD may still be wrangling with Bennett over part of that right of way. The water district says the pipeline is just as critical for its own customers. The line doesn’t tap into any new reservoirs on the Tarrant County side of the project, but it increases capacity to draw water from two East Texas reservoirs—Richland-Chambers and Cedar Creek, both on tributaries to the Trinity River—that are already key to the TRWD system. The two man-made lakes provide about 75 percent of the water used by Fort Worth and its surrounding cities. Without the Integrated Pipeline, TRWD officials said in July, their customers will outstrip water supply in just a few years. Driving Force: Bennett’s hotel business, Ashford Group, and his penthouse condo are in Dallas. 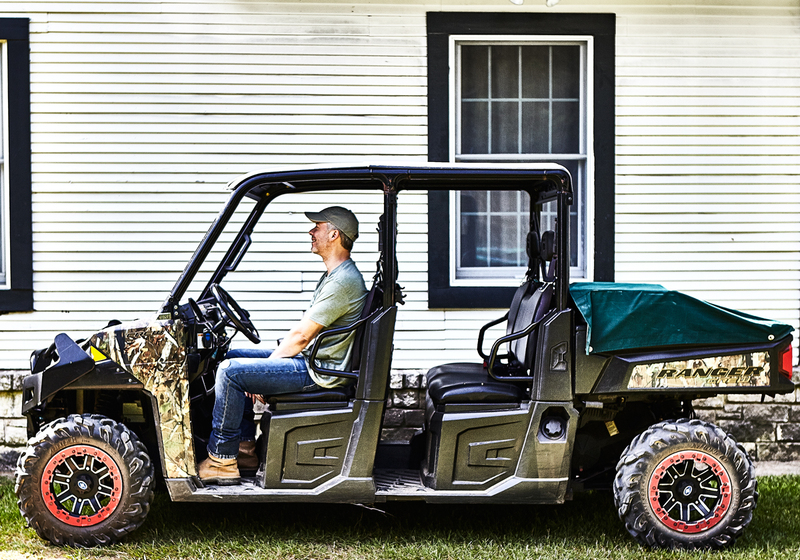 But he feels more at home behind the wheel of his Polaris Ranger, wandering around his 1,500 acres in Athens. But aside from the route, critics of the water district’s plan say that the pipeline won’t actually accomplish what it’s designed to do. They argue that the water district is already pulling the maximum amount of water allowed out of those two lakes, and that Dallas’ water needs will ultimately prevent any benefit for the western half of North Texas. Water district officials, not surprisingly, see it differently. If anything were to take down one of their pipelines bringing water from East Texas—a break or pump station failure—the Integrated Pipeline would provide another delivery route. Creating a connection between the two systems makes good regional sense, allowing Dallas Water Utilities to sell water to the Tarrant Regional Water District and vice versa. The line would also position the two agencies to tap into other reservoirs in the future. As soon as Bennett got that notice on his gate, he started researching the pipeline and the Tarrant Regional Water District. What he found surprised him. “There’s a whole cottage industry of people who hate the TRWD,” he says. When Bennett was in junior high, he started reading a set of encyclopedias that his family owned. Every night, he took a volume with him to bed. “My favorite was L,” he says. That’s the one that covered lasers. With that same focus, he schooled himself on the Tarrant Regional Water District and the agency’s eminent domain powers and, eventually, the intricacies of sovereign immunity—how governmental bodies are immune to certain problems faced by individuals. Problems like getting their land rights taken by another governmental body. Less than a year after his first contact with the water district, Bennett got a local legislator (whose campaign he had supported) to sponsor a bill creating the Lazy W Conservation District, a governmental agency with standing equal to that of the TRWD, in terms of taking land for right of way. It meant that the water district couldn’t condemn his land. When an influential legislator friendly to the TRWD got that agency’s designation changed to one that gave it more power, Bennett got the Lazy W’s designation changed, too, making it again the equal of the TRWD. That standoff still has to be settled by the courts. But Bennett isn’t just relying on his sovereign immunity strategy. There’s also the graveyard. He and his wife and his mom have always talked about being buried at the ranch. So in 2014, he dedicated a cemetery at the Lazy W. Right now there are just two graves. One is that of a friend’s relative, a World War II veteran whose body had been cremated. The remains were sitting in a shoebox in a closet until he provided a place for burial. The other was an acquaintance; the family didn’t have money for a cemetery plot, Bennett says. In last year’s Tarrant Regional Water District board elections, both sides used the cemetery as an argument in their fliers. Bennett-backed candidates railed against the TRWD for wanting to put the pipeline through a burial ground. The political action committee supporting incumbents sent out a flyer showing what appeared to be a freshly dug-up grave. “Puppet master” Monty Bennett “relocated the dead bodies of a veteran and an elderly woman” in his attempt to block the pipeline, it said. Bennett acknowledges that he chose the cemetery’s location in part so that it would lie in the proposed path of the pipeline and provide another argument against having to surrender that right of way. But he also says his desire to establish a cemetery on his ranch was genuine and long-standing. “I can want a cemetery, and I can put it in the path,” he says. The same sentiments apply to some of the wildlife he has brought to his ranch. “I thought, ‘What can I do with the animals?’ Because that’s what I love anyway.” He added endangered species to the other exotic animals on his ranch, because there may be federal protection for their habitat. It’s true, he admits, that he added those animals after the pipeline fight started. But they were always part of the business plan for the ranch that he laid out, on paper, well before the Tarrant Regional Water District came along. In his research, Bennett found allies in a diverse group of critics of the water district, people with questions about flood control measures, objections to the Trinity River Vision project in Fort Worth, or objections to other land condemnations for the pipeline. The critics all charge the agency with arrogance, a lack of transparency, and cronyism. Their issues have become Bennett’s as well. In the last three years, Bennett has spent a few hundred thousand dollars to try to get new faces on the elected board of the water district. He has raised additional money from others and done volunteer work. He even dressed up as Elvis once to talk to voters outside a polling place. Thus far, in two elections, Bennett has managed to get just one person elected to the five-member TRWD governing board: Mary Kelleher, a feisty juvenile services supervisor who has had epic battles with water district staff. Charles Crook has never met Bennett, but he calls him “basically my hero. He’s the one who showed that these guys can be fought.” Crook is an engineering and land development consultant with a 3-acre property just outside of Mansfield, southeast of Fort Worth, where he and his wife plan to live the rest of their lives. The water district wants to run its pipeline through it. He says TRWD staff have lied to and repeatedly misled him, as he, like Bennett, has tried to convince the agency that there is a better route for the pipeline. The line will take only a sliver of his land, but Crook says some of his neighbors’ properties will be chopped into worthless fragments. About 20 families worked without success to get the water district to accept an alternate route that was shorter and would have caused headaches for owners of only one property, he says, rather than 33. For six years, Crook has kept a detailed log of his interactions with water district staff. It runs to 18 pages, and he has highlighted in yellow every instance when, he says, a TRWD employee misled him or a document represented something that turned out not to be true. There’s a lot of yellow. Jim Oliver, general manager of the water district, is familiar with Crook’s name and the complaints from the Mansfield property owners. He calls Crook’s log “his interpretation” of events and says the alternate pipeline route would have inconvenienced just as many people as the water district’s planned route. They just aren’t Crook or his neighbors. And Oliver says that Crook must have misunderstood what he was told about whether his property was likely to be in the way of the pipeline. As for Bennett, Oliver doesn’t express any opinions about him personally—he’s never met him—but he’s clearly not a fan of Bennett’s maneuvers to protect his property. Oliver says that to move the pipeline, “we would have to hit a bunch of 5- and 10-acre homesteads and take out a lot of houses,” and he thinks Bennett wants it moved “just because he’s Monty Bennett.” (Bennett says he has seen a Dallas Water Utilities document that showed several different routes for the pipeline near his ranch and that none of them would take out any houses.) Oliver predicts dire consequences if the courts allow Bennett’s strategy to work, if he can create his own district to stop another district from condemning his land. He added endangered species to the other exotic animals on his ranch, because there may be federal protection for their habitat. It’s true, he admits, that he added those animals after the pipeline fight started. Attorney Jim Lane, a former Fort Worth City Council member who now serves on the TRWD board, has problems with a lot of the things Bennett has done, and he believes the water district has acted properly in Bennett’s case. But Lane has empathy for Bennett, because he fought his own battle over an attempt to take land from his Parker County ranch for a pipeline right of way. In his case, it was a gas company line. The “big gas company boys” were “pushy,” he says. But he managed to convince them to move the path of the line. Bennett is doing “what every American has a right to do,” Lane says. Last year, Bennett wrote a letter to Dallas oilman Ray Hunt, trying to convince him not to donate to the re-election campaigns of Tarrant Regional Water District board incumbents. Bennett included a kitchen-sink list of allegations raised against the agency over the years about lake houses and deer leases maintained for board members and employees, and a lax ethics policy that fosters nepotism. Bennett sent several such letters to wealthy Dallasites who had contributed to the re-election campaigns of board incumbents. He didn’t hear back from Hunt or most of the others, but he says he did convince one Dallas donor to drop his support. Oliver says the stuff about lake houses and hunting is blown out of proportion. The modest houses stand on property bought by the TRWD for reservoir creation or other legitimate purposes. They are mostly used by water district workers and employees from other agencies who need to be on-site for a few days—not luxury hideaways for board members and top staffers. Same goes for hunting: the land is part of the agency’s holdings around its lakes, and it isn’t safe to allow the public to hunt there. As for the allegations of nepotism in his organization, Oliver does acknowledge that he has two nephews on the water district’s payroll. But, he says, both men have worked their way up and earned their current jobs. Besides, officials at other agencies, police and fire departments, also hire family members. He also argues that the water district’s anti-nepotism policy applies only to elected board members getting jobs for their relatives. Staff aren’t covered. That’s news to board member Kelleher, the one supported by Bennett. She says she found the almost 20-year-old ethics policy that was on the books. It applied to staff, but with a major loophole allowing the general manager to make whatever exceptions he deemed fit. Kelleher and other critics of the water district see Bennett as a huge help to their cause, not only because of the money he donates but also because of the hope he engenders. Kelleher wouldn’t have gotten elected without his help, she acknowledges. During her time on the board, she’s had a combative relationship with Oliver, been censured by her colleagues, and been on the losing end of many votes, but Kelleher says she’s recently been able to work with some of her colleagues, including Oliver, and has accomplished some things that she’s proud of. Even if the water district were to decide tomorrow to leave Bennett’s ranch alone, he probably wouldn’t go quietly into the night. He says that experience with the water district has made him consider getting involved on a larger stage, on statewide issues like eminent domain rules, ethical requirements for governmental agencies and officials, and transparency. Aaron Harris, a Tarrant County political operative and real estate investor, says he expects Bennett to be active but to keep a low profile while working on issues in the future—what he’d intended to do before his opponents turned him into the focus of the water board campaign. “The mistake most people make is in assigning nefarious motives to Monty Bennett,” Harris says. “People don’t understand that, with him, what you see is what you get. His business interests are not affected by what he is doing [politically]. His opponents have been trying to find his pain threshold. They can’t. “The best activists get involved because they are affected personally,” Harris says. “And then they get changed for life. At times, as Bennett gives a guest the grand tour of his ranch, it’s tough to know whether he’s talking about the exotic animals or the bureaucracy he has struggled with for years. He could have been describing himself. Gayle Reaves is an adjunct journalism professor at UNT. She was part of the Dallas Morning News team that won a Pulitzer Prize in 1994 for international reporting.